ConstructionContext's subclasses describe different ways of constructing an object in C++. The context re-captures the essential parent AST nodes of the CXXConstructExpr it is assigned to and presents these nodes through easy-to-understand accessor methods. Definition at line 233 of file ConstructionContext.h. Definition at line 235 of file ConstructionContext.h. Definition at line 261 of file ConstructionContext.h. References clang::C, clang::serialized_diags::create(), and clang::BumpVectorContext::getAllocator(). 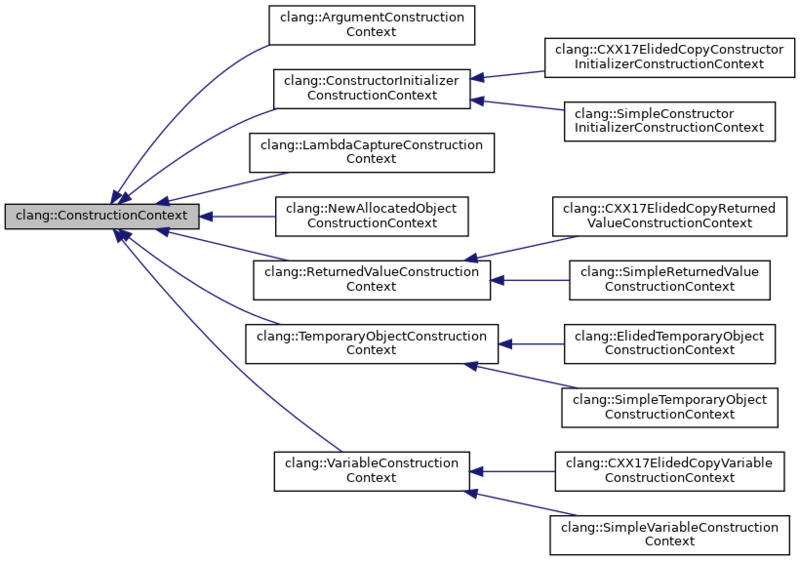 Consume the construction context layer, together with its parent layers, and wrap it up into a complete construction context. May return null if layers do not form any supported construction context. Definition at line 164 of file ConstructionContext.cpp. References clang::ConstructionContextItem::ArgumentKind, clang::C, clang::ConstructionContextItem::ElidableConstructorKind, clang::ConstructionContextItem::ElidedDestructorKind, clang::Type::getAsCXXRecordDecl(), clang::QualType::getCanonicalType(), clang::ConstructionContextItem::getCXXCtorInitializer(), clang::ConstructionContextItem::getIndex(), clang::ConstructionContextLayer::getItem(), clang::ConstructionContextItem::getKind(), clang::ConstructionContextLayer::getParent(), clang::ConstructionContextItem::getStmt(), clang::Expr::getType(), clang::CXXRecordDecl::hasNonTrivialDestructor(), clang::ConstructionContextItem::InitializerKind, clang::ConstructionContextLayer::isLast(), clang::ConstructionContextItem::MaterializationKind, clang::ConstructionContextItem::NewAllocatorKind, clang::ConstructionContextItem::ReturnKind, clang::ConstructionContextItem::TemporaryDestructorKind, and clang::ConstructionContextItem::VariableKind. Definition at line 296 of file ConstructionContext.h. Referenced by clang::VariableConstructionContext::classof(), clang::SimpleVariableConstructionContext::classof(), clang::CXX17ElidedCopyVariableConstructionContext::classof(), clang::ConstructorInitializerConstructionContext::classof(), clang::SimpleConstructorInitializerConstructionContext::classof(), clang::CXX17ElidedCopyConstructorInitializerConstructionContext::classof(), clang::NewAllocatedObjectConstructionContext::classof(), clang::TemporaryObjectConstructionContext::classof(), clang::SimpleTemporaryObjectConstructionContext::classof(), clang::ElidedTemporaryObjectConstructionContext::classof(), clang::ReturnedValueConstructionContext::classof(), clang::SimpleReturnedValueConstructionContext::classof(), clang::CXX17ElidedCopyReturnedValueConstructionContext::classof(), clang::ArgumentConstructionContext::classof(), clang::ento::ExprEngine::CreateCXXTemporaryObject(), and print_construction_context(). Definition at line 257 of file ConstructionContext.h.